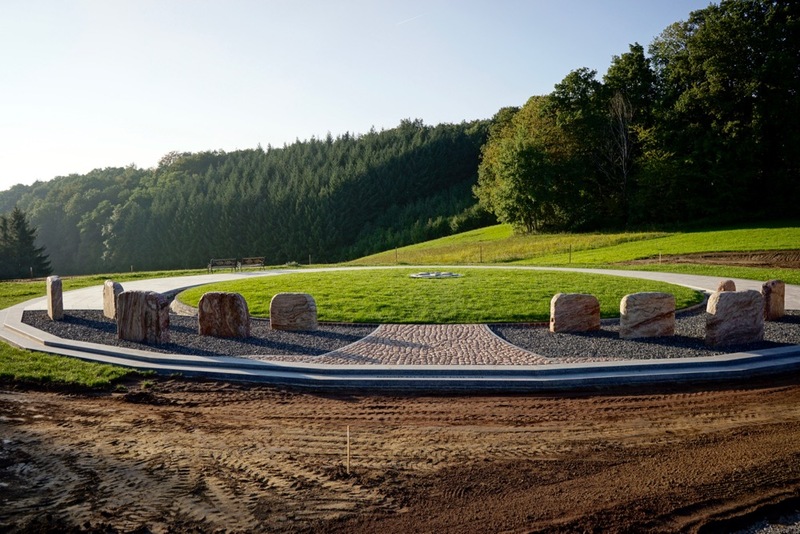 A trench is dug to demarcate with polished granite stones the “dance floor” from a 70-cm-wide ring. 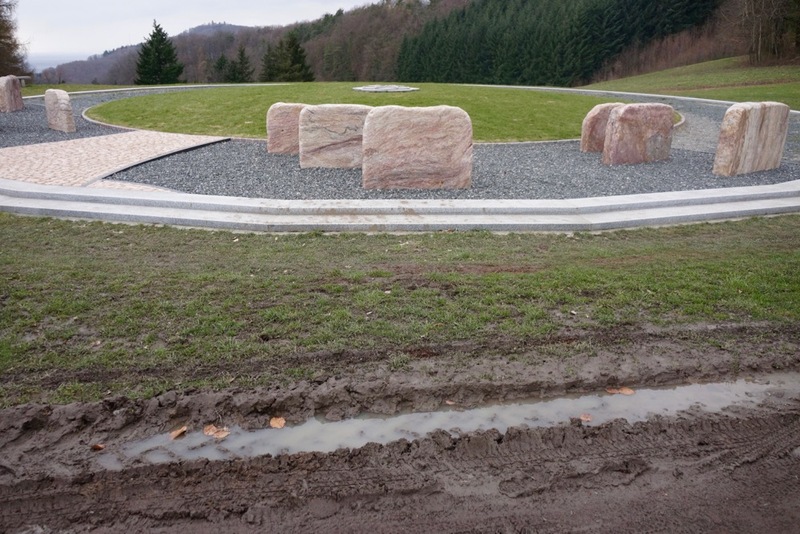 The stones were cut-to-size by the company Kurz Natursteine. The 70-cm-wide ring will later show a rainbow. 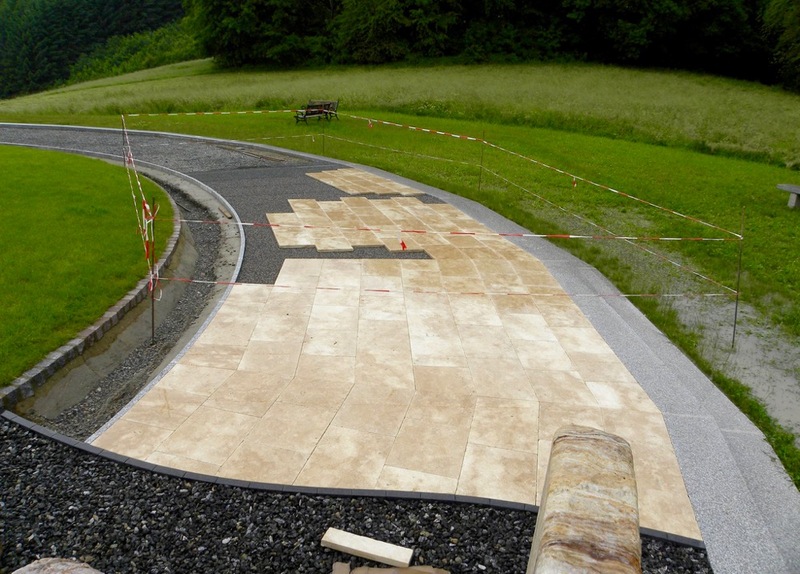 The ochre “dance floor” is made of travertine slabs (next picture). 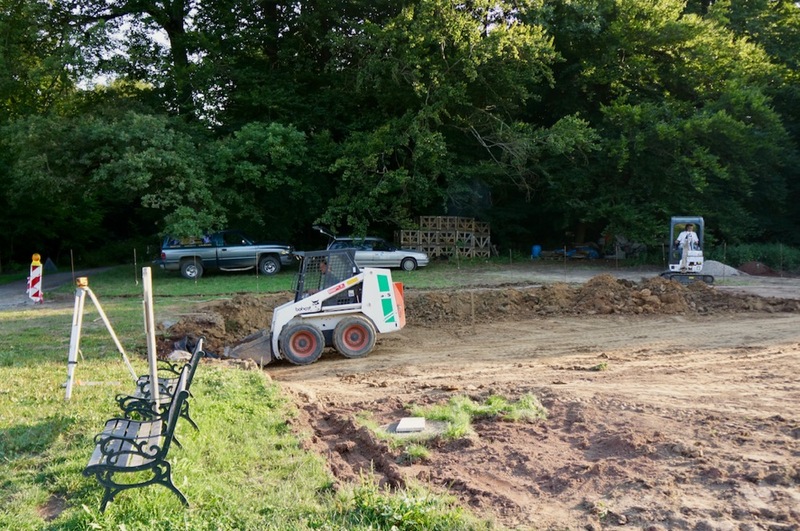 The ring for the rainbow has been dug. The “dance floor” is placed. A serious drainage problem becomes apparent. A problem seldom comes alone. The situation escalated into a serious threat to the future of the project. 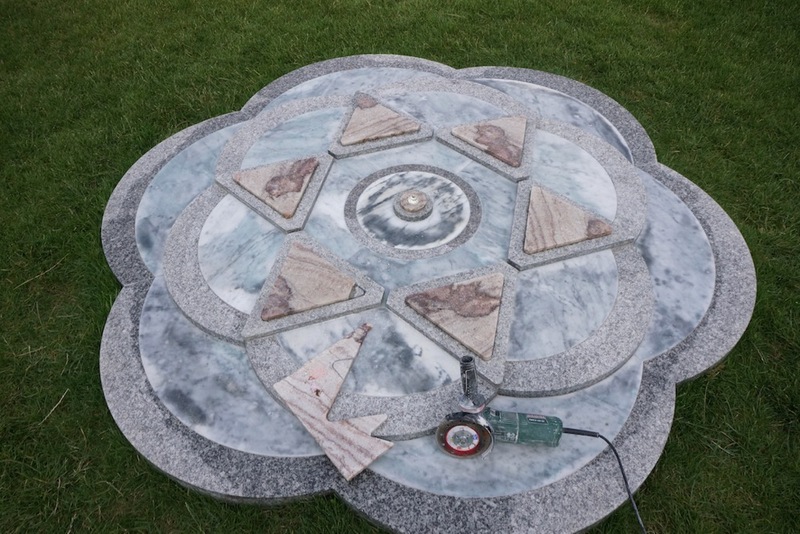 It is as if the Rose of Shalom wanted to make the hidden attacks visible: its white marble shows black discolourations. Carelessly, an iron-containing substance had been scattered on the marble. A corner of the star is broken off. Adults keep climbing on top of the star to receive its “energy”. Of course, this was never my intention. Each individual carries this Rose inside, and it’s no use trying to draw “energy” from the star through physical proximity. Such external representations can never replace the laborious process of internal reflection and improvement. The material is not designed to carry the weight of an adult either. It is a simple symbol of meditation that strives to touch and inspire people. I still have some oddments of Odenwald quartz left, used for the pink triangle. First, I make a blueprint of the edge of the missing corner and draw it onto the quartz plate. Then, I use an angle grinder to cut the piece to size. It is subsequently glued on, and the seam is made invisible using a sealant which I gave the same colour. 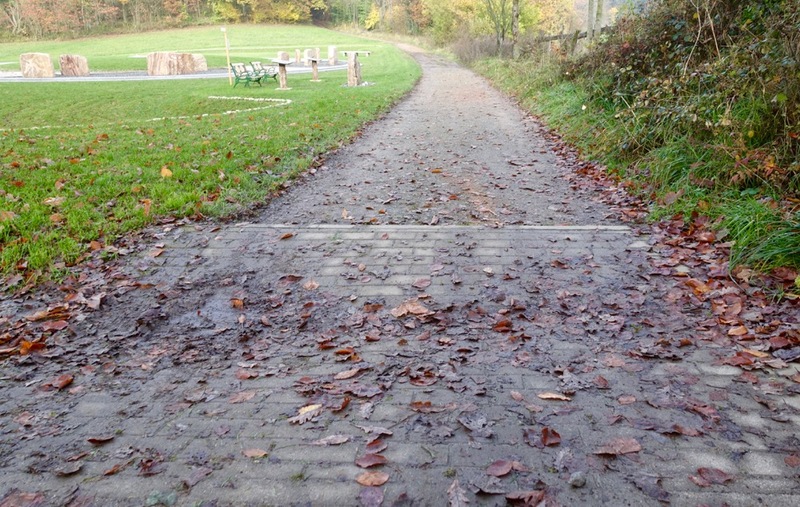 After the reconstruction, the repair measures are no longer visible. I apply an organic sulphur compound over the period of a year to counteract the black discolouration. This compound slowly removes the iron from the material again. 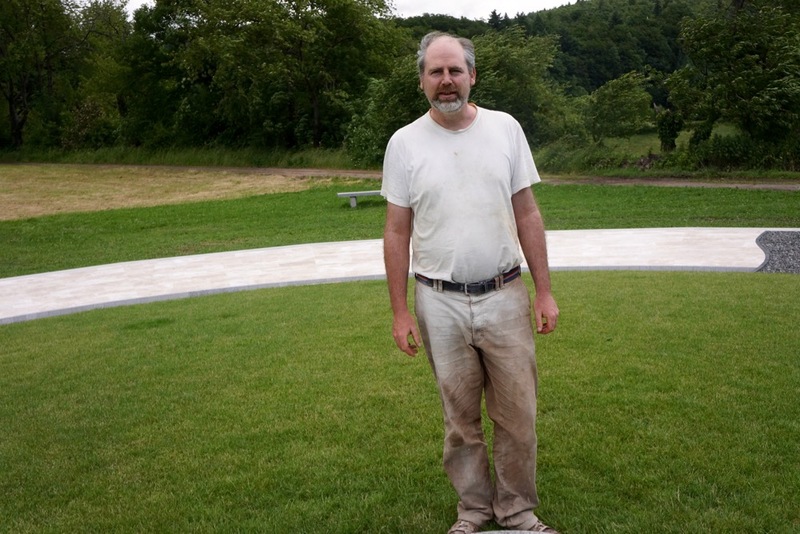 By now, I have cut hundreds of travertine slabs exactly to size and finished them by hand. 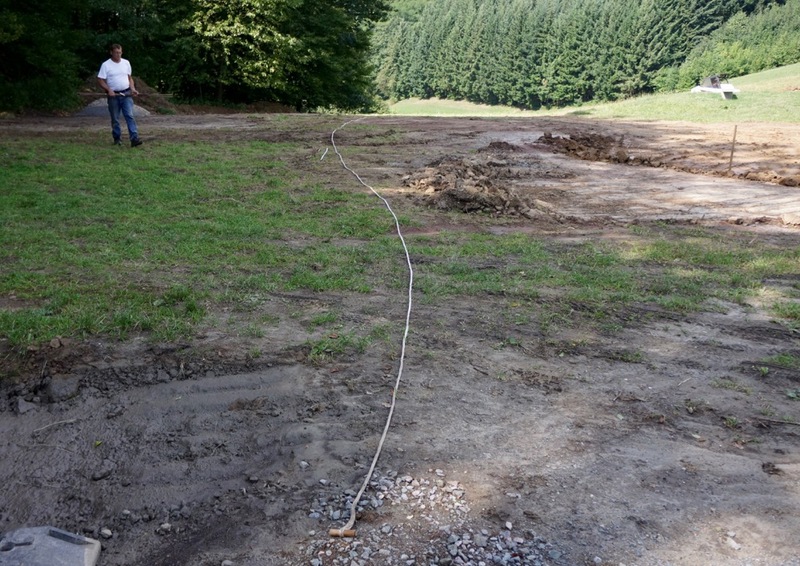 Ferdl and Freddy follow a special pattern as they place them in a ring on a gravel bed. The pattern is the result of lengthy experimentations with design software. I wanted to create an inviting and cheerful surface, which at the same time draws attention from the outside towards the center with its very clear and structured geometry. Travertine slabs have been used to assemble the rest of the surface in a geometric form. The dance floor is ready! Less than 3 days after the valuable and handsome material was placed, 40 slabs were vandalized; some slabs were even broken. This image shows the situation at the beginning of the year. It clearly shows the drainage problem, which became apparent around one year earlier. Sludge splatters into the monument. Water no longer drains over the left-hand side, because the KMB-Bensheim no longer makes any drainage cuts on this side. The water now accumulates on the road and even runs against the monument's circle. 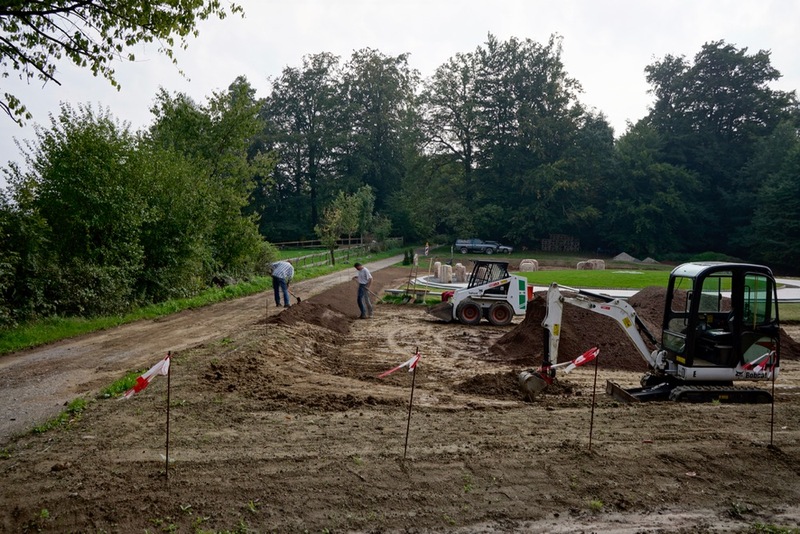 The water can no longer be distributed over the meadows to the left and right and seep away quickly (more information about the drainage problem). We make an agreement with the local authority of Lautertal. 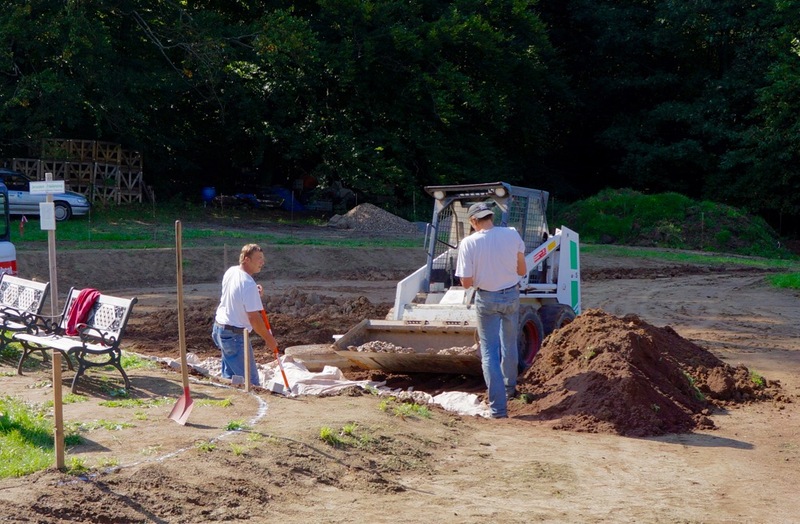 They allow us to construct a drain for the water in the road – at our own cost – that will lead away the water over the right-hand side of our property (seen from the Seltzer Water House). 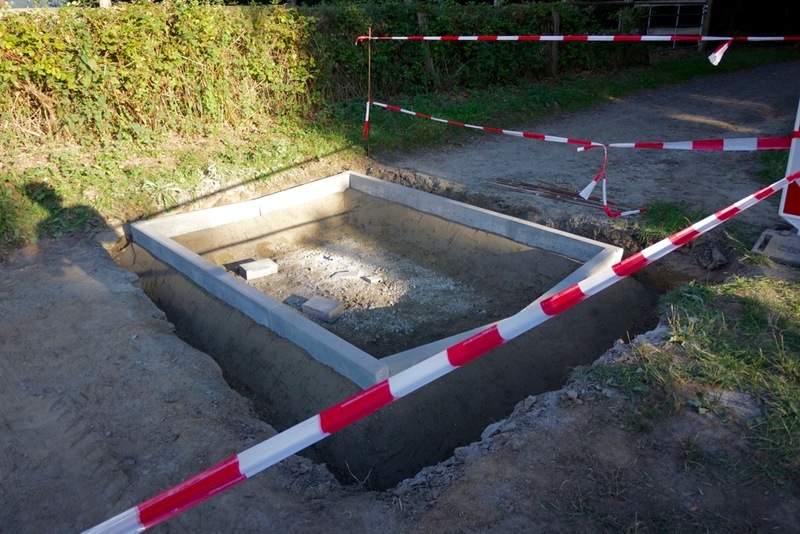 This is what the finished drain for the water will look like later. The immense effort pays off and the system works well – as long as the road is not damaged by heavy log transports. 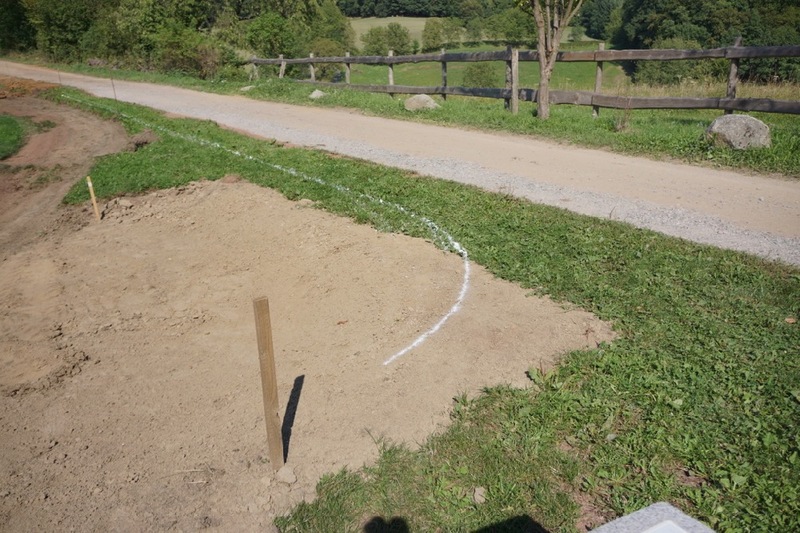 We first mark the desired shape into the terrain. 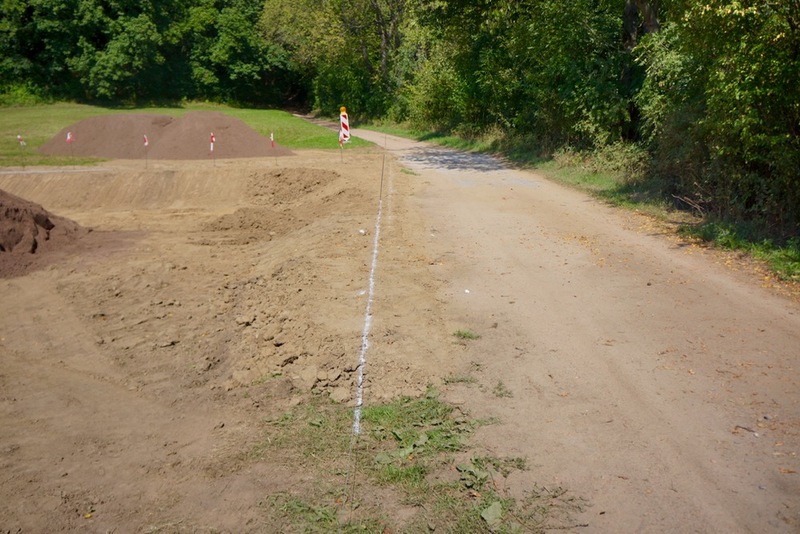 The line shows where the embankment will be on the terrain, which still needs to be levelled. 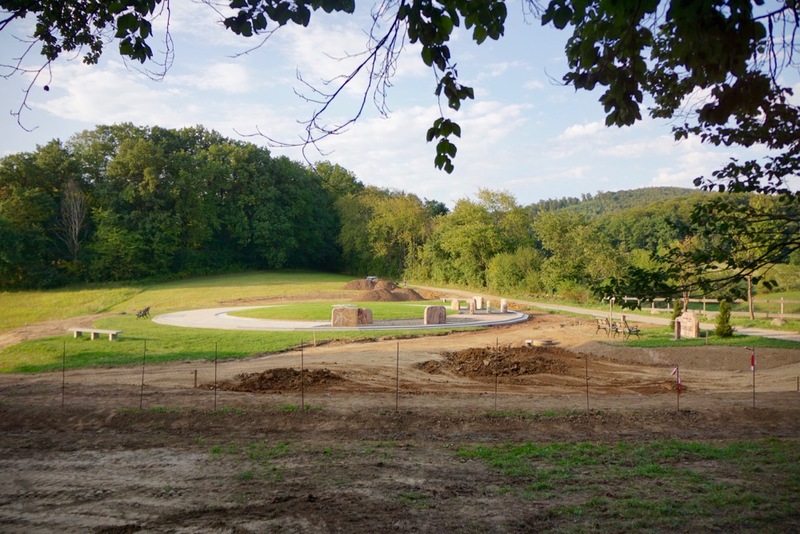 The terrain surrounding the Circle of Peace has been levelled to further alleviate the drainage problem. 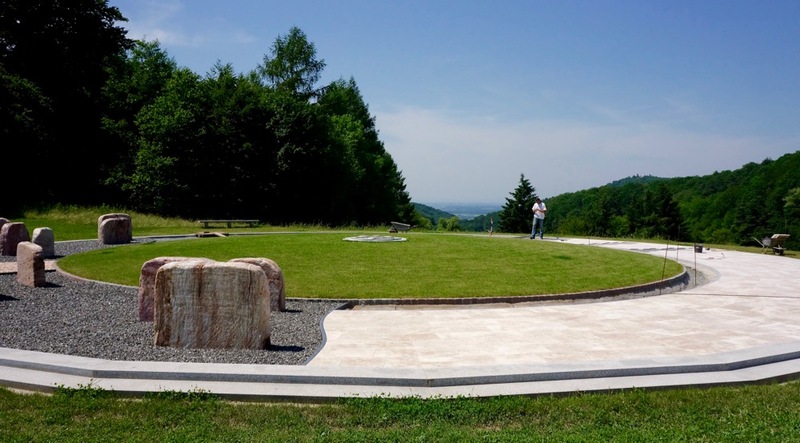 The monument is located in a small well. 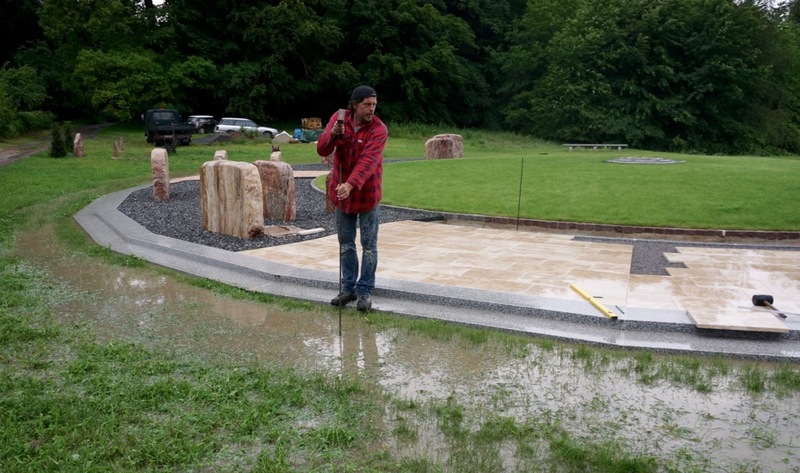 By levelling the terrain surrounding the monument, water no longer flows against the monument from both sides to accumulate there. The level surface also drains the water more effectively. This is the right-hand side of the terrain. 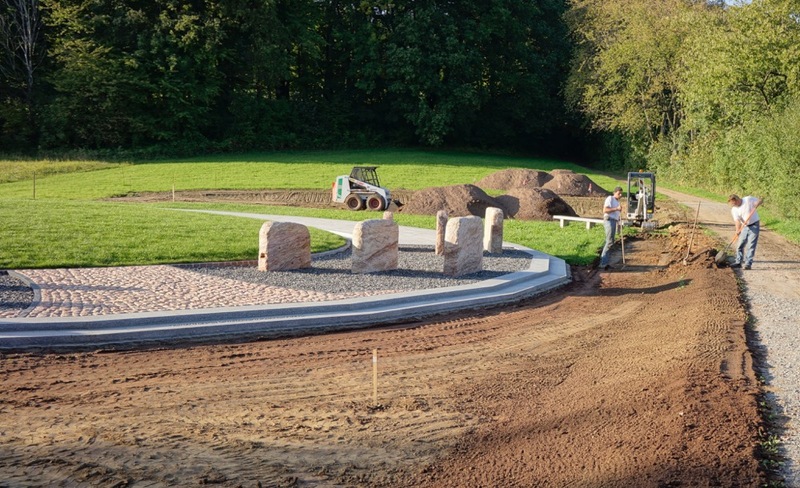 The white line shows the border to the embankment, which will be created in the shape of an angel’s wing. 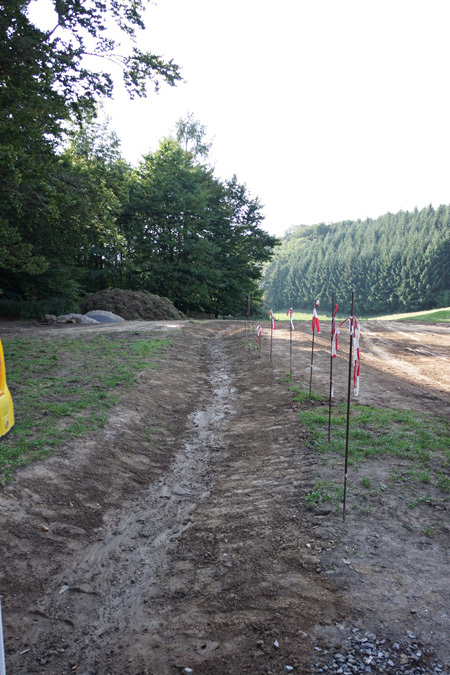 The terrain on this side has been also levelled. 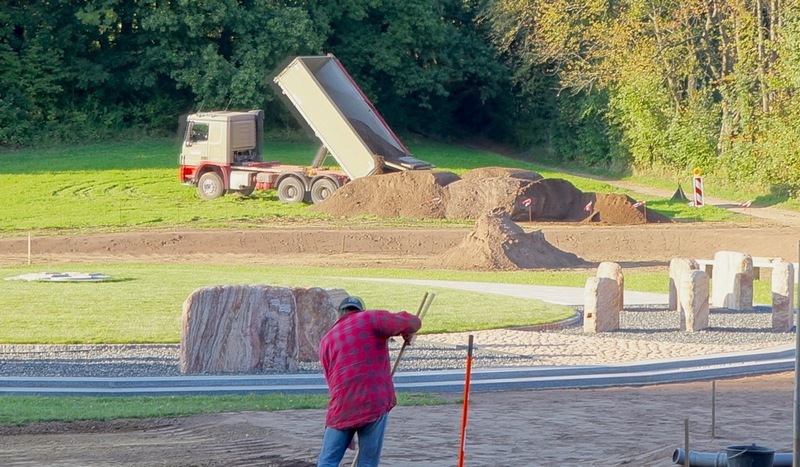 Here, Freddy and Ferdl apply new soil to the levelled surface. 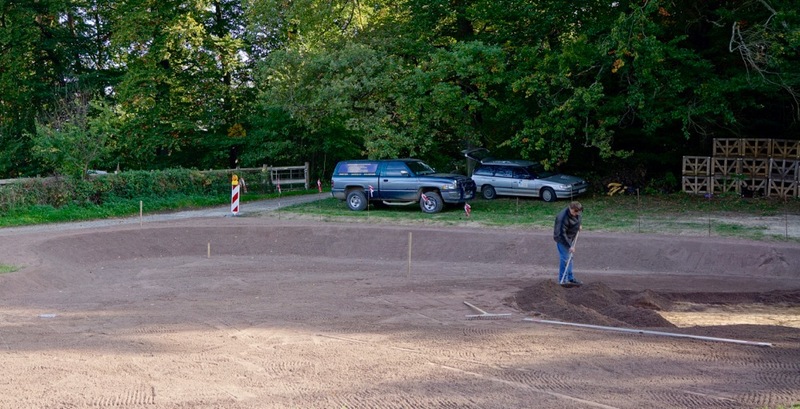 A large mound of soil can be seen between the diggers. 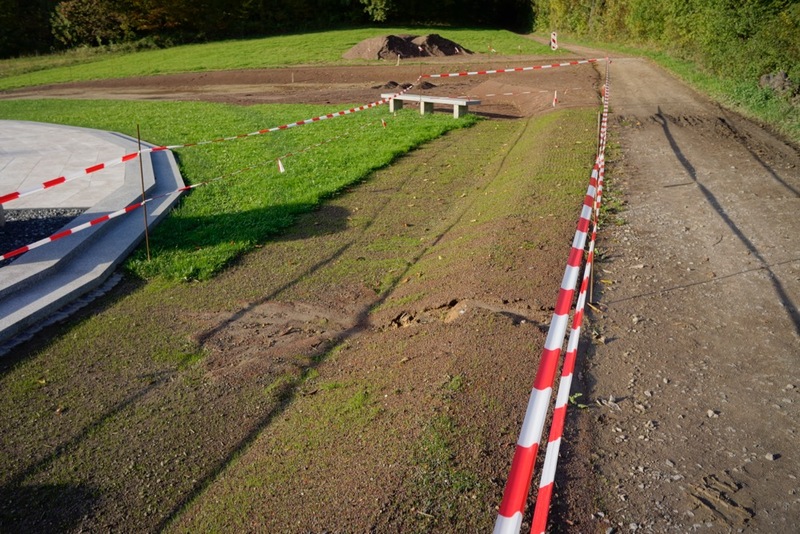 The mounds of soil that have been used to model the terrain can be seen in the background. A new delivery. At least 40 truckloads of vegetation soil have been delivered in total. We start constructing the “angel’s wing” on the left-hand side. I follow my feelings in placing a rope that resembles the shape I envision here. The mould has been marked off with metal rods. 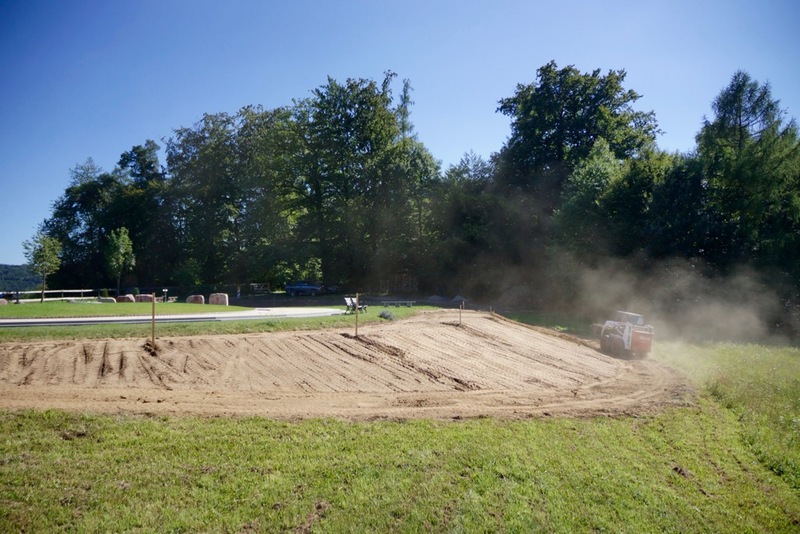 Ferdl Zanitzer starts to remove soil in accordance with the specified dimensions. Instead of a level square surrounding the monument, my design now foresees two angel’s wings surrounding the monument's circle. Ferdl and Freddy build it for me. 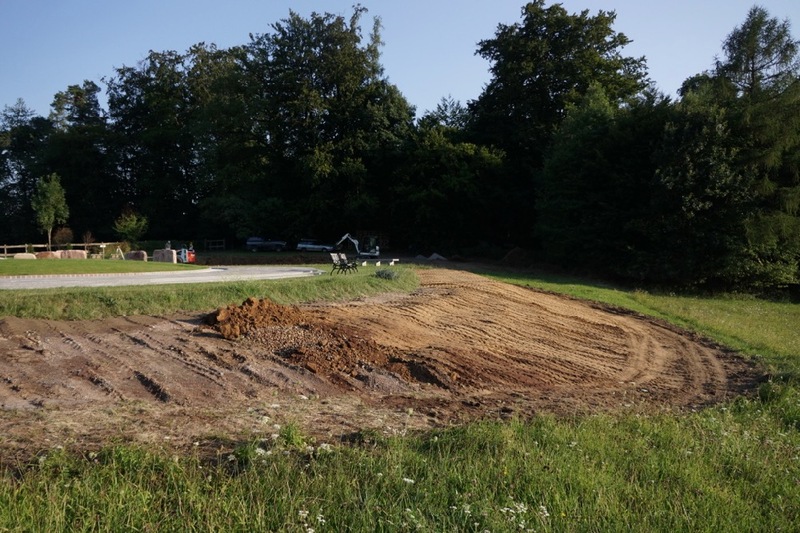 A lot of soil must be removed to level the terrain surrounding the monument. 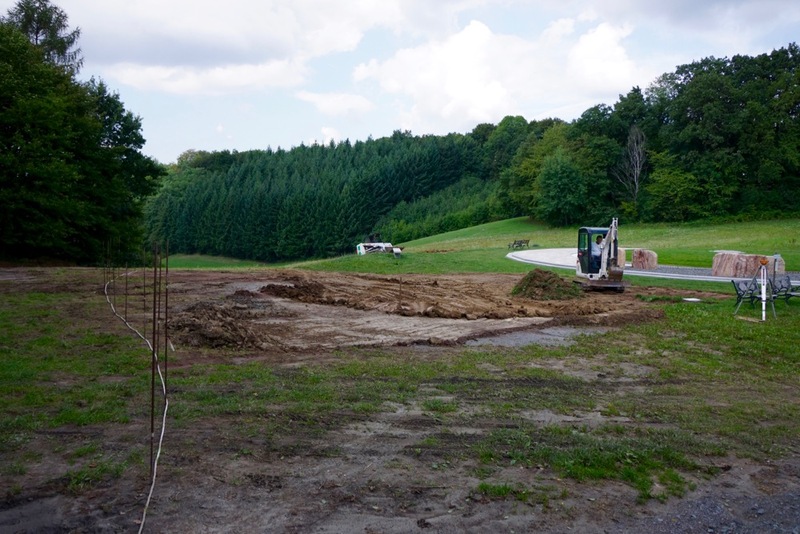 Instead of just disposing of the soil, we use it to extend the plateau significantly towards the Hochstädten Valley. 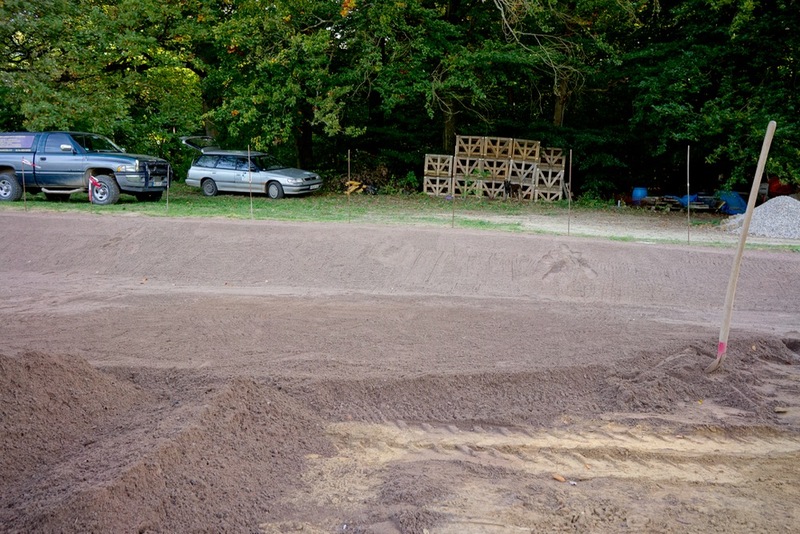 A view of the plateau before putting the new soil there. 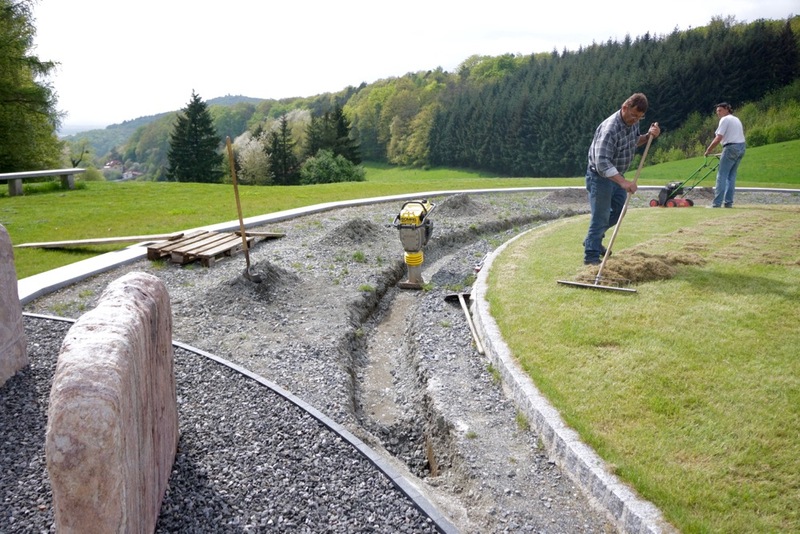 Freddy already removed the lawn to allow the old and new soil layers to fit together properly. 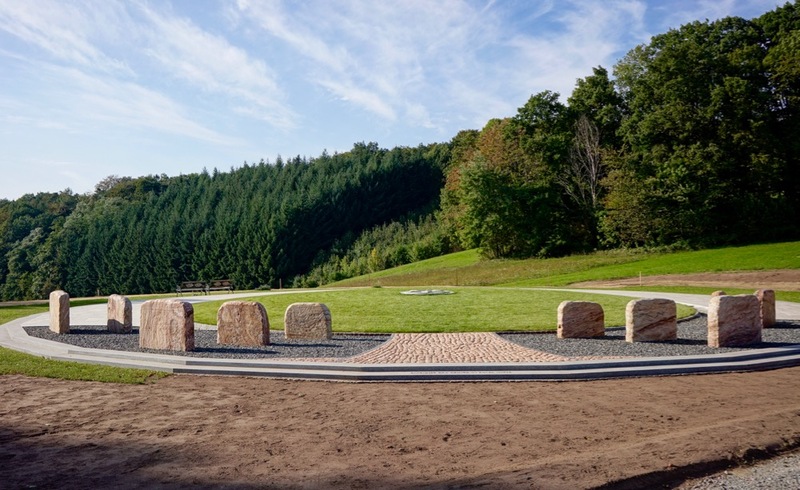 With the soil, we have expanded the plateau and created a viewing platform for the view unto the Rhine Plain. So the soil has been used meaningfully. The larger plateau will also enhance the effect of the monument's circle. 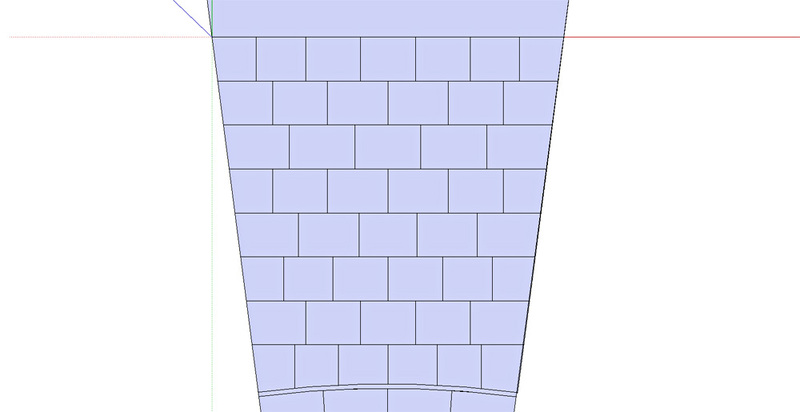 The white line at the side shows the desired shape. The angel’s wings not only help drain the water, they also look attractive. 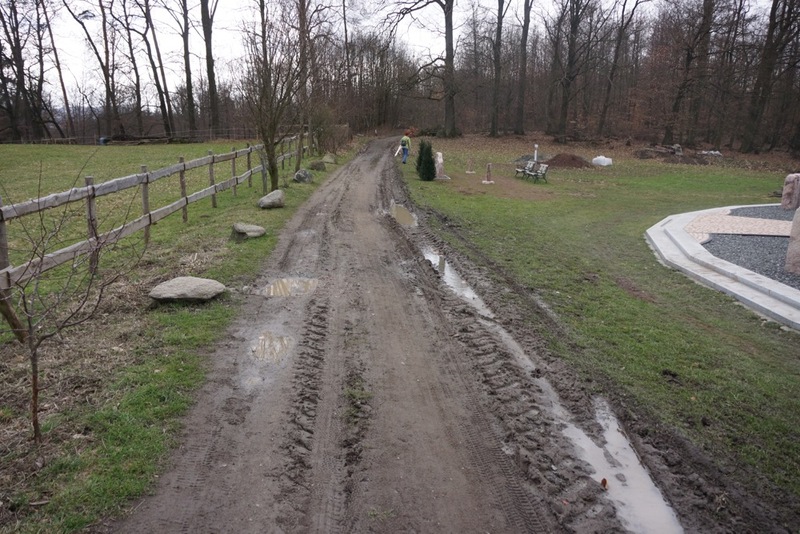 This is the drainage trench that leads water away from the road and towards Hochstädten. The drainage trench can be seen in the foreground. The new vegetation soil can be applied after levelling the terrain in the angel’s wings. The soil has been used to model the delicate shape of the angel’s wings. This image shows the thick layer of soil. It allows for a good modelling of the terrain. The thick, fertile soil will later on facilitate the healthy growth of wild herbs. The modeling of the terrain has been completed, and all the soil has been filled in. The shape of the angel’s wings can be recognized clearly now. 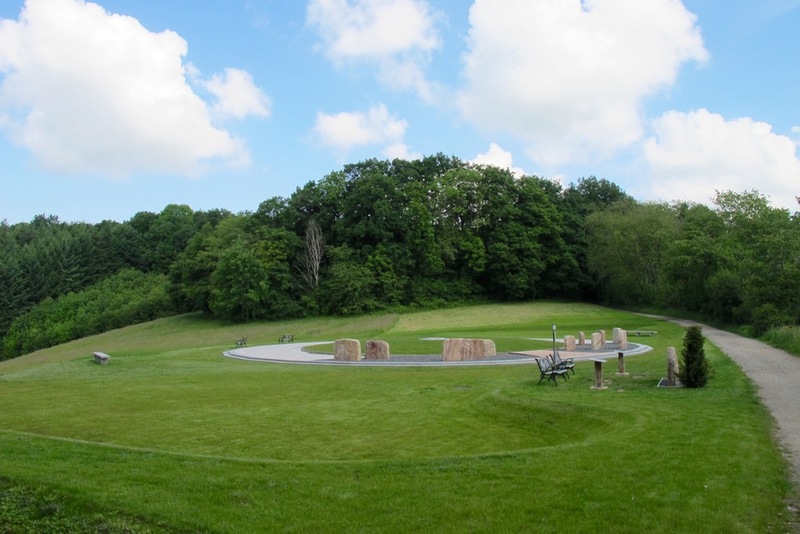 This is what the “angel’s wing” will look like on May 28 next year, after the new grass has grown. Back to the present: The soil has been filled completely, and the terrain is been modeled. 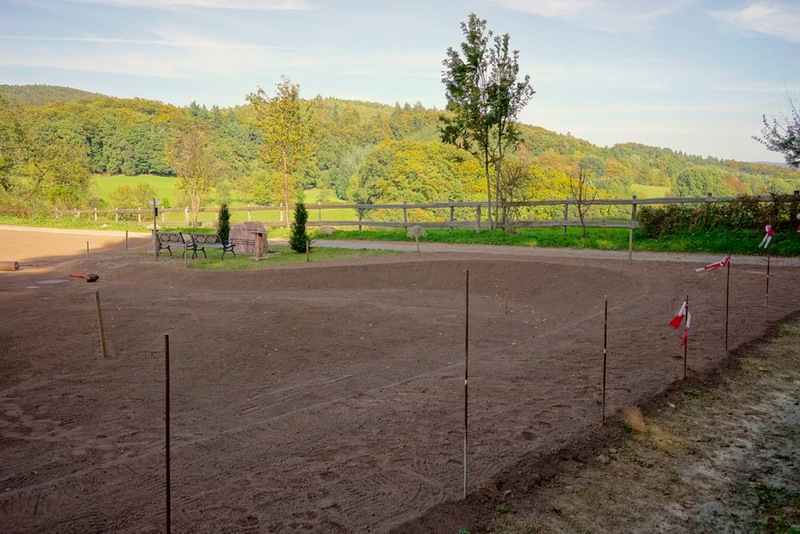 The grass seeds can now be sown. The grass starts growing shortly after the terrain has been redesigned. 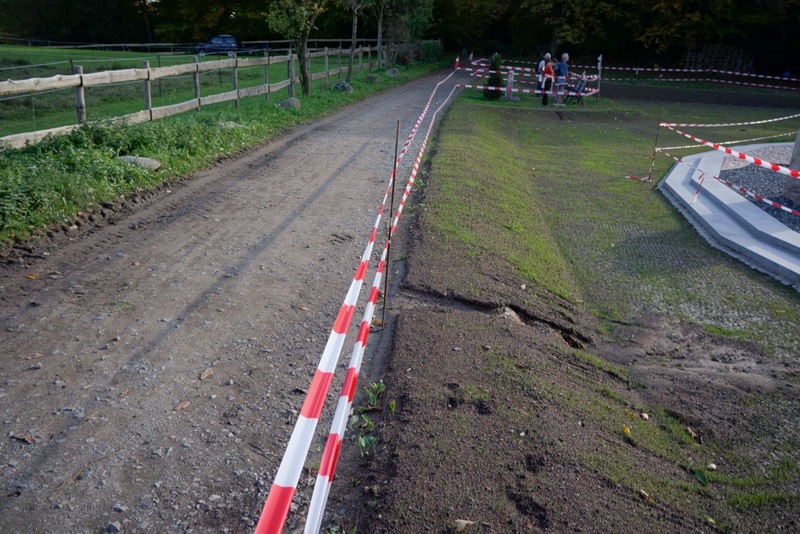 The terrain has been cordoned off to allow the grass to grow properly. Construction is finished for now.